It would have been very tough before the season to anticipate that this game would have been as significant as it is. Both teams are unbeaten, and Stanford already has a loss, so this game will have dramatic significance in the Pac-12 standings. It wasn't tough to imagine USC being in this situation, but the Cougars are ahead of expectations. Sure. Washington State hasn't played anyone of real significance yet - Boise State is the biggest win, and that was in overtime. But the offense is elite - which isn't surprising under Mike Leach - and the defense has been excellent - which is close to shocking. 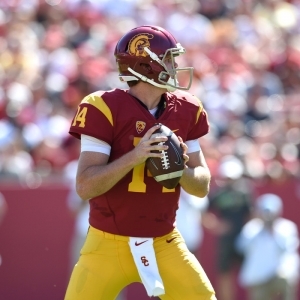 USC has struggled with consistency at times, but when they look good they look really good. It shapes up as a very interesting and significant game. Before the season started it felt like a lot of people had already given USC QB Sam Darnold the Heisman. It hasn't quite turned out that way. Despite the 4-0 start, Darnold has not only played himself way out of that race, but he is clearly the second-best QB at this point in this game - by a fairly wide margin. Darnold looks just like he is - a young QB with a shortage of experience. When he's good he's really special, but he makes bad decisions without an excuse too often, and that has resulted in far too many interceptions - seven with just nine touchdowns. He hasn't hurt the team this year, but he isn't the kind of guy who puts the team on his back and wins games on his own - which is what Heisman winners do. Washington State's Luke Falk isn't likely to win the Heisman, either, but the senior is playing incredible football right now. He has completed more than three-quarters of his passes, and he has 14 touchdown passes and just one interception. Leach's system lends itself to passing success, but Falk is exceeding the scope of the system and is showing poise and vision that only comes with a strong combination of talent and experience. Washington State has the edge here. Of course, how a QB performs has a whole lot to do with the defense that they have to face. This is tougher to judge - at least to a point. USC has been pretty underwhelming defensively - they rank in the middle of the nation in terms of passing yards and points allowed. They have played four reasonably decent offensive teams, though - or three plus Texas, anyway. The defense has bent a lot but hasn't broken yet, and it has come through when it needs to in order to secure the win. And they have a whole lot of athleticism to draw on. Washington State measures up much better statistically - 11th nationally in yards allowed, and 12th in passing yards. They allowed 44 in an overtime battle against Boise State, though, and have beaten up far-less-impressive teams. So, they have bullied outmatched offenses, but a solid offense was able to exploit them. I still feel like Falk is more likely to have a strong day than Darnold, but both guys have the potential to put things together if they are playing well. I go back and forth on how much I really believe in the idea of trap games. You have to look at this as a potential trap game for the Trojans, though. Pullman is an ugly place to visit, but it will be a tough place to play on Friday night. Leach is very creative and ruthless - sometimes reckless - so he will have a few things up his sleeve. And this is the fifth straight reasonably-challenging game that the Trojans have played, so there is a chance that their focus won't be entirely sharp. Washington State, meanwhile, has had a reasonably soft schedule and will have had this game circled on their calendar for months. The game opened with USC favored by four points on the road, and that has since fallen to 3.5 in early action. Sixty percent of bets have been on the Cougars, so we could see the line move further, though oddsmakers will be hesitant to move through the key number of three because of the risk of being middled. The total opened at 49 and has crept up slightly to 49.5. The Trojans are 6-1 ATS in their last seven conference games but just 1-4 ATS in their last five games overall. They are 3-8 ATS in their last 11 road games. The Cougars are 13-6 ATS in their last 19 conference games but just 2-5 ATS in their last seven games overall and 0-5 ATS in their last five against teams with winning records. They are also 0-4 ATS in their last four Friday games. I feel like gambling. USC is much more talented, but Washington State has nothing to lose, they have an outstanding quarterback, and they are a home underdog - something I always like to see. The Cougars are worth a bet here.